Today we made our own stamp to print flowers. Cassie created this simple printed project with modeling clay, a toothpick, tempera paint, and markers. You could also used play dough, but just make sure it is not too squishy and that your little ones don't press too hard so that the stamp gets out of shape! I did try it with play dough and it works!!!! First we rolled some modeling clay into a ball and flattened it out like a pancake. 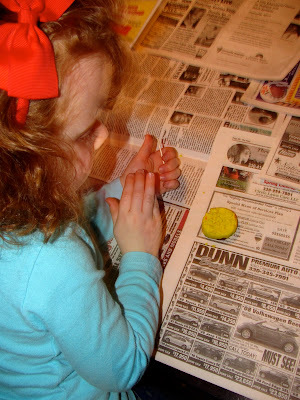 Cassie wanted to play with the clay, but I explained to her that she was going to make a stamp. It is VERY difficult to convince a child that they cannot play with clay!!!!!! After flattening the clay, Cassie used a toothpick to draw a simple flower design in the clay. A little challenging at first, but she got the idea once I showed her one I did. Then you'll need some tempera paint on a sponge to make a stamp pad. You could also paint the stamp or just put some paint on a dish or recycled lid. You'll need your carved stamp too. The one pictured here has already been used!! Then Cassie went ahead and began printing her stamp. You have to press down a bit so that all of the flower will print. My daughter printed the stamp twice each time before using more paint. More printing to fill up the page and pressing down! We let it dry for a few minutes and then Cassie used a green marker to add stems and leaves. Cassie has drawn lots of flowers so she knew to add leaves without me telling her. Here is my daughter's finished work again. Very nice! She said she was done. Lots of short activities lately for this busy girl! There is a whimsical feel to this and I LOVE IT! Such a great idea - you could really have fun with all sorts of shapes and designs with this. Would playdough work too? Thanks Deborah! I did try it with play dough and it does work! Make sure it is not too squishy and that you don't press to hard or the stamp will lose shape!! Thanks for the feedback----I added the information above!!!!! Oh my these are BEAUTIFUL! Didn't she do well with the stems and leaves too! Brilliant! Thank you so much for linking to Kids Get Crafty! okay, you had me at "chocolate muffin tree!" i so love that, so adorable! if that tree grows, let me know because i think the world would be much happier if chocolate chip cookies grew on trees! so happy to "found" you today! Stamping projects where you make your own stamp -- now that's the best kind! This is too cool! I love the process and the way the completed picture looks. thanks for sharing our shaving cream eggs on your fb too! Another fantastic idea! I think my little Kirsten would adore this. Oh that`s wonderful! Kids love printing (and so do I, it`s such a relaxing activity :) ). 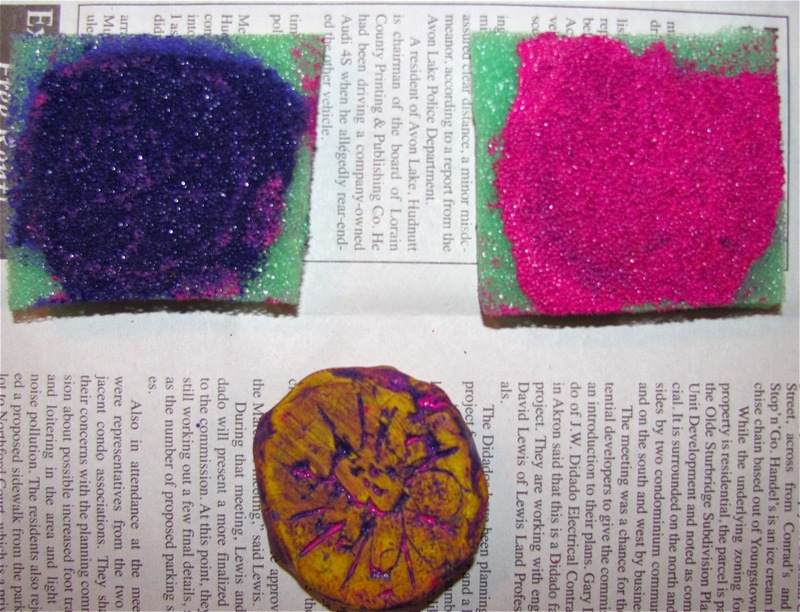 And it`s a good opportunity to use up old playdough. Love how you made a stamp with clay! Neat idea! Love the end product! I am having a giveaway on my blog. $20 store credit from My Carrie Creations to get a backpack with your kids fav character ( fancy Nancy, princessses, ballerina and more). Check it out. What a great idea - we've never tried using clay in this way. Thanks for linking up with the Play Academy- lovely to see you again. What a fabulous idea!! I would never have thought to try something like that. Awesome!! Thanks for linking this project up with For the Kids Fridays! I love how her flowers came out! We will have to try this and see if we can do it with other shapes too! Thanks for linking up to It's Playtime! Oh wow this looks like great fun, muust try this soon! The blog looks like a great fun. i am glad to to up with these ideas.